Principal photography began on October 21, 2015, in Los Angeles. The film was released on March 24, 2017, by Warner Bros. Pictures and grossed $26 million worldwide. It has a 17% approval rating on Rotten Tomatoes, which called it "only mildly arresting at best". Unlike the original series, the movie was produced without the cooperation of the California Highway Patrol (CHP) and without a license to use CHP logos. A getaway driver known as Chacho (Michael Peña) assists a crew of bank robbers in evading the Miami Police. After exchanging vehicles, Chacho reveals himself as Agent Castillo of the FBI, who then converge on and arrest the bank robbers. At the same time, Jon Baker (Dax Shepard) enrolls in the California Highway Patrol Academy. Despite his low aptitude score across every field, Sgt. Gail Hernandez (Maya Rudolph) sympathises with Jon, noting that he can ride a motorcycle better than the majority of cadets she has trained and grants him a probationary graduation. On a California highway, an armored van is attacked by a crew of bike riders. One member identified by the guard as "LT" accuses the guard and TJ, his CHP closet boyfriend of stealing from him from a previous hit. TJ, who happens to be responding to the hit at the time, arrives overhead in a Police helicopter. LT informs TJ over the police frequency that he must choose who lives (TJ or his boyfriend) as punishment. TJ ultimately jumps from the helicopter and falls to his death. In Miami, Castillo is informed by his boss Peterson (Isiah Whitlock Jr.) that the CHP have requested the FBI's help in the armored van heist, believing that a corrupt police ring is involved. Castillo is ordered to go undercover within the CHP and is given the alias Francis Llewellyn "Ponch" Poncherello. Ponch is partnered up with Baker and the two head to ostensibly pay respects to TJ's widow at home. Baker points out that there isn't a single commendation, picture or other effects a helicopter pilot would have in the house, and later precisely identifies the bikes used in the heist as the Ducati Hypermotard 939. The bike gang makes another attempt on an armored van. The crew evade Ponch and Baker on the faster Ducati's after a lengthy chase through Elysian Park. LT, already wary of Ponch's extensive investigations into the heists finds out from his FBI contacts that he is undercover, whereas Ponch also obtains a potential lead on an apartment TJ tenanted at. Ponch concludes that TJ had to have been corrupt, as it would not have been affordable on his salary. Sensing that something is still amiss, Ponch and Baker re-visit TJ's widow. Officer Parish - who had previously warned Ponch not to return - fights him until he is subdued by Baker. Ponch recognises that Parish is not in on the corrupt circle, after he suggests that "LT" in reality could stand for Lieutenant. Ponch and Baker arrive on the profile of Lieutenant Raymond Kurtz (Vincent D'Onofrio) and immediately suspect him, but have nothing to pin him to the heists. The FBI pick up on a promising lead to a drug house in Venice, prompting Ponch and Baker to respond and give chase to one of the bike crew members. During the lengthy pursuit, Officer Brian Grieves (Ryan Hansen) secretly informs LT that the suspect involved is his son. Whilst crossing a bridge, the suspect is decapitated by a recovery vehicle's extended industrial wire. LT arrives and crashes into Baker who was in pursuit. Parish arrives in his police helicopter and airlifts an unconscious Baker to hospital. Corrupt Officer and Ponch's love interest Lindsey Taylor (Jessica McNamee) attempts to console LT over his loss, but is instructed to wait for Grieves until he is discharged from hospital. Petersen fires Ponch for disobeying his orders to stay well away from Allen's lead, and Baker also discovers that his ex-wife Karen (Kristen Bell) who Baker had been living with, has sold her house whilst he was in hospital without telling him. At Ponch's house, Baker identifies the decapitated biker as Raymond Reed Kurtz Jr., CHP Lieutenant Ray Kurtz's son, confirming their earlier suspicions. Ponch returns to the CHP Central Station and is sworn in as a CHP Officer whilst Ray kidnaps Karen and holds her hostage at his safe house. Ray gives Ponch and Baker her location, but the two are ambushed by Ray en route. Both Ponch and Baker rescue Karen as Officer Ava Perez (Rosa Salazar) arrives with back up, but are attacked by Ray's associates. Ray shoots off three of Ponch's fingers, leaving him unable to return fire and instead rely on Baker's poor aim to retaliate. Baker alters his aim to compensate for this, but accidentally triggers an explosive device that incapacitates Ray and his remaining guards, who Perez and the other Officers arrest. Ray comes to, but is reinforced by Taylor and then holds Baker at gunpoint. Ponch intervenes moments before Ray fires a shot into Baker's arm which ricochets off of a titanium implant and strikes Ray in the head, killing him instantly. Baker is loaded onto an ambulance to be treated for his injuries. Karen offers to join him in hospital, however Baker finally realises how little she cares for him and declines her offer. Ponch is given morphine by a Paramedic (who is played by Erik Estrada in a cameo appearance). A final cut scene shows Castillo receiving a call from Peterson, who offers him his job back at the FBI. Castillo however refuses, preferring to stay in the CHP. Michael Peña as FBI Agent Castillo and CHP Officer Francis Llewellyn Poncherello. Dax Shepard as CHP Officer Jon Baker. Vincent D'Onofrio as CHP Lieutenant Raymond Kurtz. Rosa Salazar as CHP Officer Ava Perez. Jessica McNamee as CHP Officer Lindsey Taylor. Adam Brody as Special Agent Clay Allen. Isiah Whitlock Jr. as Special Agent Peterson. Kristen Bell as Karen Baker, Jon's estranged wife. Jane Kaczmarek as CHP Captain Jane Lindel. Erik Estrada (uncredited) as Paramedic. ...I’m always looking for something that will hold both comedy and motor sports. I’m looking for anything that I think I can combine those two things and that someone will make... I couldn’t have gone into any studio and said, “The movie’s called, uh, Eat My Dust” — well, that’s actually a title — “Burn Rubber, and it’s me and Michael Peña, and we’re on motorcycles.” They’d go, “No thank you.” It had to have a safety net, and the safety net I found was CHiPs, which as a kid I saw it, I was 2 when it came on originally and I think I was 8 when it went off the air... I lived in Detroit and it was cold and cloudy every day, and you’d turn this show on and for an hour you were in California, and it was beaches and palm trees and this weird pair on motorcycles, and as a kid, I was in. I didn’t follow any of the plotlines, and I didn’t know what the show was about, but it just had California and motorcycles. I thought, this could hold a Bad Boys version of the movie, because your heroes have motorcycles, so it’s got an inherent coolness if we just keep pushing in that direction. On September 2, 2014, Warner Bros. announced a film adaptation of the 1977-1983 TV series CHiPs created by Rick Rosner, Andrew Panay would be producing along with Shepard. Shepard also wrote, directed and starred in the film. It was announced that Panay would produce the film through his Panay Films along with Ravi Mehta. In August 2015, the film was selected by the California Film Commission to receive $5.1 million in tax credits. Principal photography on the film began on October 21, 2015, in Los Angeles, California, utilizing many of the same sections of Southern California freeways used for the original television series, notably Interstate 210 in La Crescenta, California. In September 2014, Warner Bros. announced that Shepard would write, direct, and star in the film as Officer Jon Baker, and that Michael Peña would portray Frank "Ponch" Poncherello. In May 2015, Vincent D'Onofrio was announced to be playing a former cop turned car thief and gang-leader. In September, Adam Brody joined the film to play an officer, while Rosa Salazar and Shepard's wife Kristen Bell also signed on to star. A few weeks later, Jessica McNamee signed on to play Lindsey Taylor, a tough young California Highway Patrol officer. In November, Jane Kaczmarek joined the film to play the police captain. In March 2016, it was announced that Ryan Hansen would join the film. CHiPs was originally scheduled to be released on August 11, 2017, but it was pushed up to March 24, 2017, by Warner Bros. Pictures. CHiPs was released digitally on June 13, 2017. Two weeks later on June 27, 2017, Warner Home Video released the film on Blu-Ray and DVD. CHiPs grossed $18.6 million in the United States and Canada and $8.2 million in other territories for a worldwide gross of $26.8 million, against a production budget of $25 million. In the United States and Canada, CHiPs opened alongside Life, Power Rangers and Wilson, and was projected to gross around $10 million from 2,464 theaters in its opening weekend. The film made $500,000 from Thursday night previews at 2,400 theaters. It went on to debut to $7.6 million, finishing 7th at the box office. In its second weekend the film grossed $4 million (a drop of 48.7%), finishing 9th at the box office. On Rotten Tomatoes, the film has an approval rating of 17% based on 101 reviews and an average rating of 3.6/10. 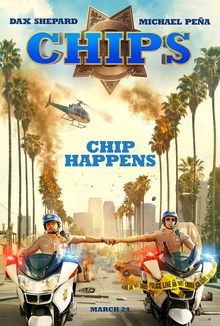 The site's critical consensus reads, "CHiPs abandons the endearing innocence of its source material, using the titular cop show's premise as a setup for aggressively lowbrow gags that prove only mildly arresting at best." On Metacritic, the film has a weighted average score of 28 out of 100 based on 26 critics, indicating "generally unfavorable reviews". Audiences polled by CinemaScore gave the film an average grade of "B–" on an A+ to F scale, while PostTrak reported filmgoers gave a 74% overall positive score and just 50% gave it a "definite recommend". Variety's Owen Gleiberman called the film lazy and clichéd, saying: "The film's model is—or should have been—the movie version of 21 Jump Street and its sequel, but the co-directors of those bumptious nihilistic undercover burlesques, Phil Lord and Christopher Miller, knew how to turn comedy into suspense and thrills into media-mad absurdity. Shepard just sprinkles overstated banter onto a generic plot and bits of pedal-to-the-metal action, as if he was serving the action-comedy gods by sticking the usual ingredients in a blender and pushing 'purée.'" The original show's star, Larry Wilcox, posted on Twitter saying, "Way to go Warner Bros - just ruined the Brand of CHIPS and of the Calif Highway Patrol. Great choice!" The film was awarded the Barry L. Bumstead Award at the 38th Golden Raspberry Awards. ^ Scheck, Frank (March 23, 2017). "'CHIPS': Film Review". The Hollywood Reporter. Retrieved December 30, 2017. ^ "CHIPS (15)". British Board of Film Classification. 16 January 2017. Retrieved 9 March 2017. ^ "'CHIPS': 15 Things to Know About Dax Shepard's R-Rated Adaptation". Collider. Retrieved March 9, 2017. ^ a b "CHiPs (2017)". Box Office Mojo. Retrieved September 10, 2017. ^ "CHiPs". Turner Classic Movies. Atlanta: Turner Broadcasting System (Time Warner). Retrieved October 1, 2016. ^ Kevin Lincoln (March 27, 2017). "Dax Shepard on Motorcycles, Michael Peña, and Why He Made a CHiPs Movie". Vulture. Retrieved September 1, 2018. ^ Fleming Jr, Mike (September 2, 2014). "Dax Shepard Driving Warner Bros 'CHiPS' Film; Michael Pena To Play Ponch". Deadline Hollywood. United States: Penske Media Corporation. Retrieved September 3, 2014. ^ a b Couch, Aaron (September 2, 2014). "Dax Shepard Making 'CHiPS' Movie for Warner Bros". The Hollywood Reporter. Los Angeles: Prometheus Global Media. Retrieved September 3, 2014. ^ a b Sneider, Jeff (September 18, 2015). "Kristen Bell Joins Husband Dax Shepard's CHiPs' Movie at Warner Bros. (Exclusive)". TheWrap. Santa Monica, California: The Wrap News Inc. Retrieved October 25, 2015. ^ McNary, Dave (August 18, 2015). "California Film Tax Credits Go to 'Conjuring 2,' 'Chicken Soup for the Soul'". Variety. Los Angeles: Penske Media Corporation. Retrieved September 7, 2015. ^ "On the Set 10/22/15: Tom Hiddleston Starts on 'Kong: Skull Island, Nina Dobrev Starts on 'Crash Pad'". SSN Insider. Los Angeles: Alex Amin. October 23, 2015. Archived from the original on October 25, 2015. Retrieved October 25, 2015. ^ Perry, Spencer (November 12, 2015). "Photos from the Set of the CHiPs Remake!". Coming Soon. Los Angeles: Evolve Media, LLC. Retrieved November 15, 2015. ^ Kit, Borys (May 26, 2015). "'CHiPs' Movie Casting Vincent D'Onofrio as Villain (Exclusive)". The Hollywood Reporter. Los Angeles: Prometheus Global Media. Retrieved June 2, 2015. ^ Kroll, Justin (September 16, 2015). "Adam Brody Joins Dax Shepard in Warner Bros.' 'CHiPs' Film (EXCLUSIVE)". Variety. Los Angeles: Penske Media Corporation. Retrieved October 25, 2015. ^ Pedersen, Erik (September 30, 2015). "Jessica McNamee Moves From 'Sirens' To 'CHiPs' & More". Deadline Hollywood. United States: Penske Media Corporation. Retrieved October 25, 2015. ^ Kit, Borys (November 10, 2015). "Jane Kaczmarek Joins Dax Shepard, Michael Pena in 'CHiPs' Movie (Exclusive)". The Hollywood Reporter. Los Angeles: Prometheus Global Media. Retrieved November 15, 2015. ^ Goldberg, Lesley (March 4, 2016). "'Veronica Mars' Alum Joins Fox Buddy Comedy 'The Enforcers'". The Hollywood Reporter. Los Angeles: Prometheus Global Media. Retrieved October 1, 2016. ^ D'Alessandro, Anthony (April 22, 2016). "Warner Bros. Sets 'CHiPs', 'It' & Untitled PG-13 Comedy For 2017". Deadline Hollywood. United States: Penske Media Corporation. Retrieved April 25, 2016. ^ "Can 'Power Rangers' Slay Disney's 'Beast' at the Box Office?". TheWrap. ^ "'Beauty and the Beast' to Repeat at #1 Over 'Power Rangers', 'Life' and 'CHiPs'". Box Office Mojo. ^ a b "Family-Branded Films On Fire At The B.O. : 'Beauty And The Beast' Embraces $81M; 'Power Rangers' Mighty With $42M+". Deadline Hollywood. Retrieved March 26, 2017. ^ "'Boss Baby' Cleans 'Beauty And The Beast's Clock With $51M+ Opening; 'Ghost' Shell-Shocked At $20M+". Deadline Hollywood. Retrieved April 2, 2017. ^ "CHIPS (2017)". Rotten Tomatoes. ^ "Film Review: 'CHIPS'". Variety. March 23, 2017. Retrieved March 24, 2017. ^ Alexander, Bryan (March 21, 2017). "'CHIPS' movie gets mixed reviews from TV stars Larry Wilcox, Erik Estrada". USA Today. Retrieved October 12, 2018. This page was last edited on 15 March 2019, at 14:56 (UTC).